Helgelson shatters Lake Mills hopes creating a 4-point lead with 1 second to go in the game. Forest City's Riley Helgeson finds an opening and the bucket. Lambert goes up for another bucket against Lake Mills. CLEAR LAKE – An undefeated Clear Lake boys basketball team may be one of the biggest surprises of the boys basketball season to this point. A Forest City team that entered play on Saturday at 9-2, despite heavy graduation losses from a season ago, may very well be the other surprise. The two squared off Saturday, Jan. 5 in a game that lived up to the hype. The Lions rode 10 three-pointers to help them overcome a stingy Indians defense for a 67-55 win that helped them improve to 10-0 on the season. Clear Lake’s uncharacteristic offensive struggles were largely the result of a disciplined Forest City guard court that put a lot of pressure on the Lions’ ball handlers. The Lions also had to overcome some foul difficulties in the front line that took away from the offensive balance that has emerged this season. Clear Lake managed to squeeze out a 10-point halftime lead but struggled to put away the Indians until senior guard Drew Enke helped spark a 14-4 run midway through the fourth quarter. Tate Storbeck led Clear Lake with 20 points, including five threes. Carson Toebe, a freshman guard, added three treys and 18 points while Enke finished with 14. Micah Lambert led all scorers with 20 points – including 14 in the second half – for Forest City. The Bulldogs' late comeback attempt fell short as the Indians picked up a one-point victory Friday, Jan. 4. The final score was Forest City 61, Lake Mills 60. Lake Mills trailed by eight points at halftime before outscoring Forest City by seven the rest of the way. Avery Busta had 19 points and dished out four assists for Forest City. Noah Miller, a sophomore, had 13 points, grabbed eight rebounds and also had four assists and two steals. Junior Riley Helgeson scored 10 points and had nine rebounds. Chett Helming led Lake Mills with 25 points. He also had seven rebounds and three assists. Caleb Bacon had seven points, 13 rebounds and four assists for the Bulldogs. 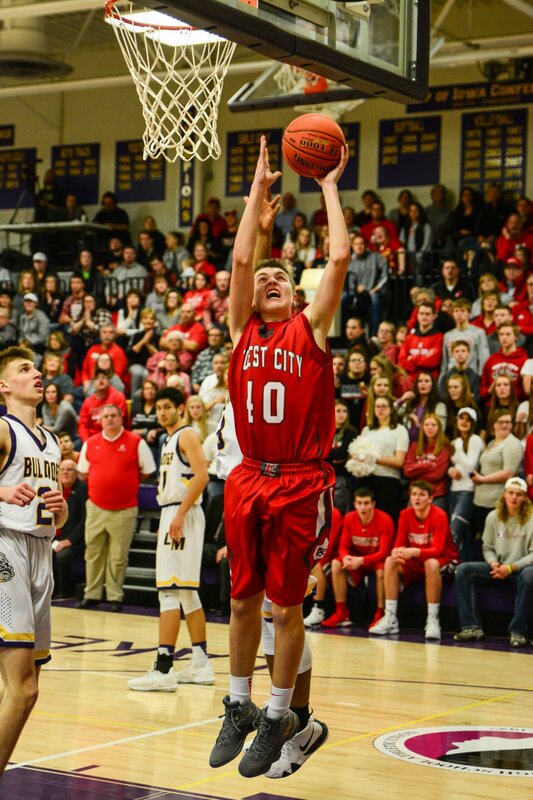 Forest City (9-3) returns home to host Eagle Grove (1-10) on Tuesday, Jan. 8. They travel to Garner-Hayfield-Ventura (8-3) on Friday, Jan. 11. Andy Heidemann puts the icing on the cake strengthening Forest City's lead over Lake Mills. Forest City's Avery Busta drives past a Lake Mills defender Friday. Busta with a steal on the fast break, late in the second half. Busta rises above the Bulldog defender for the shot. Forest City's Avery Busta helps bring back the Indians from a large deficit, with this two point shot. The Forest City crowd shows its excitement about the win and thrilling competition. Forest City's Andy Heidemann shows confidence from the three-point line. Forest City's Busta drives towards the lane early in the first quarter. Forest City's Micah Lambert helps Forest City take the lead against Lake Mills. Forest City's Miller attempts another shot along the baseline. Forest City's Noah Miller helps spark the Indians back into the ballgame. Lambert blocks a shot by Lake Mills. Noah Miller creates shots by great ball handling. The Forest City Indians take on the Lake Mills Bulldogs.